Wood is a wonderfully versatile and potentially sustainable building material which, for good reasons, is now also increasingly being discovered for the construction of apartment block buildings. However, fire protection regulations are still a restriction for high-rise wooden constructions. For example, wooden buildings in Germany which are above a certain height must have escape routes made of non-combustible material such as concrete. In Austria, regulations are similar and as a result, what will soon be the highest wooden house in the world, the HoHo in Vienna, will have a concrete core. We have reported on this previously in our blog. Now, a small town in Norway is about to challenge the HoHo. 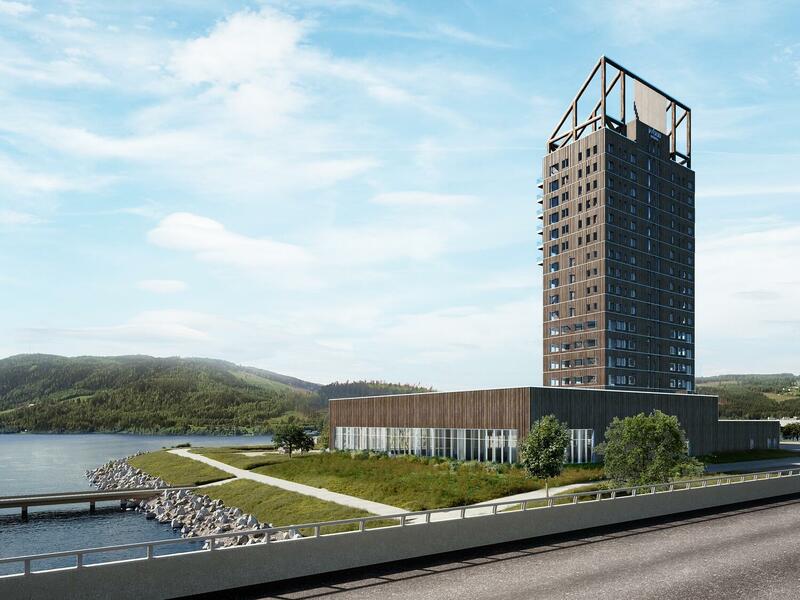 “Mjøstårnet” (Mjøsa Tower) is the name of the project that is currently emerging in the Norwegian town of Brumunddal should be for the town what the Eiffel Tower is for Paris. However, while Paris is certainly well-known all over the world, even without the Eiffel Tower, Brumunddal would probably only become widely known because of Mjøstårnet. The 18-floor mixed use building is intended to reach a height of 81 meters – and would thus become the highest timber house in the world. But just a moment, there was … correct: At about the same time, the HoHo will emerge with a height of 84 meters. 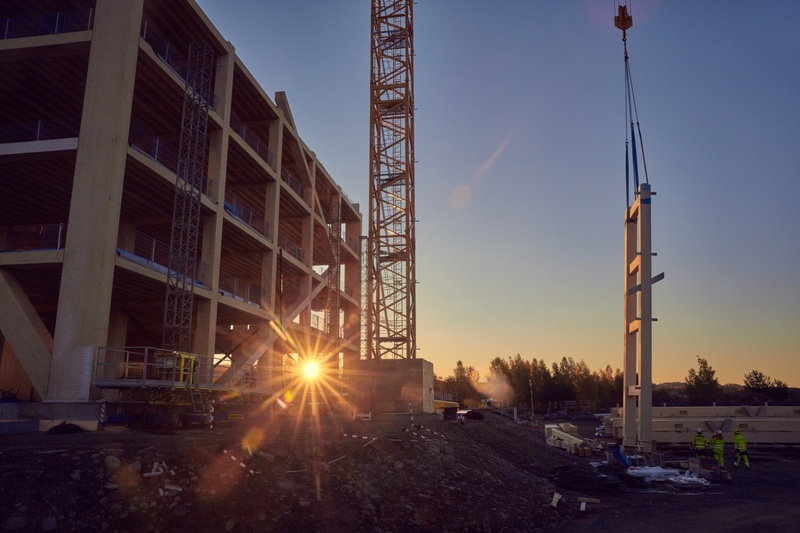 Wouldn't that actually make it the world’s tallest timber house? If it were up to the creators of Mjøstårnet, definitely. Because, strictly speaking, the HoHo is not a pure wooden house but a hybrid construction with considerable proportion of concrete (25 per cent). In fact, a steering committee of the CTBUH (Council on Tall Buildings and Urban Habitat) is dealing with the question of exactly what describes a timber construction. In all likelihood, the standard, which will be defined in the near future, will be to the benefit of Mjøstårnet. World record or not: The question as to why people can get along without concrete in Norway, unlike in Austria, is much more interesting. Is fire protection not taken so seriously in the far north? Rather unlikely. On the contrary, the Norwegians have much more confidence in their expertise in the construction of large timber structures and in the wood itself. For instance, the timber manufacturer, Moelven, which was involved in the construction of Mjøstårnet, has knowledge of extreme timber constructions as evidenced by the components for "The Tree" (also called "Treet") in Bergen it provided, which, with its 49 meters, represents the highest pure timber house to date. As with The Tree, Moelven will also supply and install the various components for Mjøstårnet. 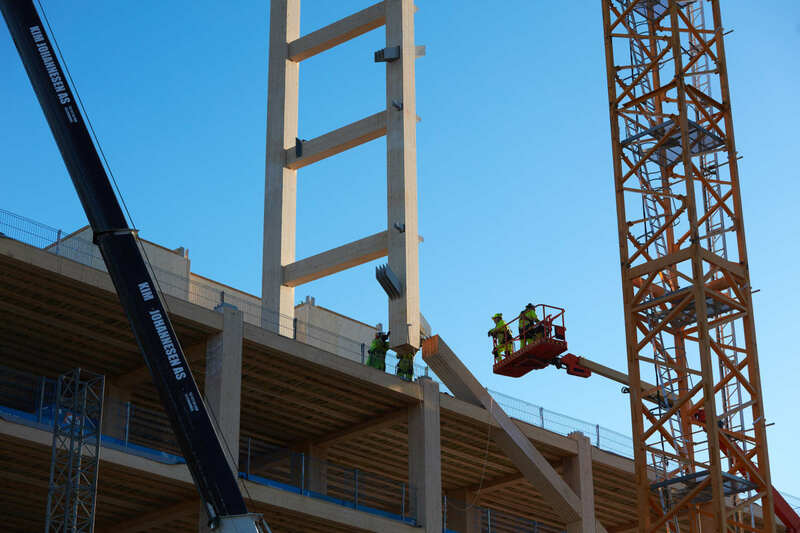 The supporting structure of the skeleton construction is made of laminated wood which has a load-bearing capacity of up to 80 percent greater than solid wood. But not only that. The mighty columns and beams additionally have better fire protection qualities than, for example, load-bearing parts made of reinforced concrete. Steel melts at high temperatures and loses its load-bearing capability, while for wood, only the top layer burns initially which has the effect of protecting the rest of the wood from further burning for a long time. If the load-bearing parts are thick enough, as is the case in the Mjøstårnet, the load-bearing capacity remains intact even after a two-hour fire. The floors and ceilings are also made of laminated wood and of robust cross-bonded (Kerto-Q) laminated veneer timber. The elevator and stairway enclosures are to be made of plywood board. This timber constriction cannot, however, do away completely with concrete because the upper seven floors are weighted down using concrete so that the tower does not swing too much and a better sound insulation is ensured in the apartments inside. In spite of this, Moelven, the developer, HENT, and the architecture firm, Voll Arkitekter, are convinced that Mjøstårnet will be considered the highest wooden house, since all load-bearing parts made of wood. For the winner, the title of "tallest timber house" is certainly highly coveted. For the rest of the world, however, the race for this honor is the benefit. 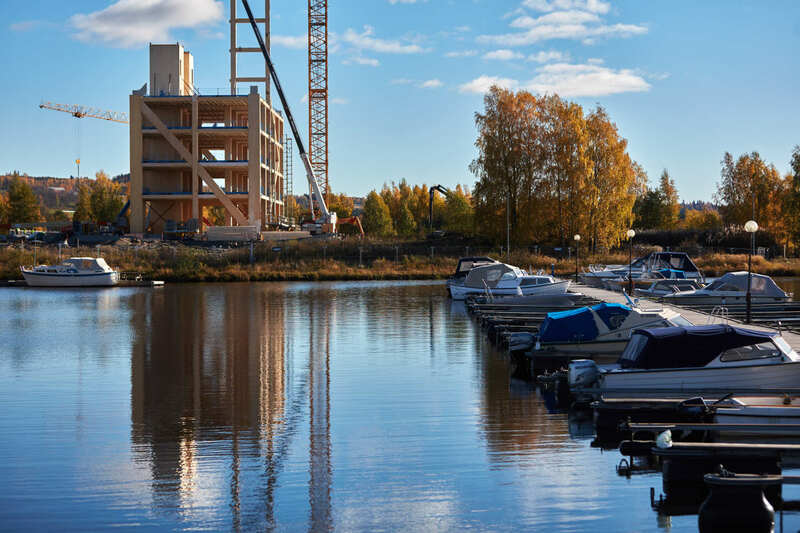 Ambitious "woodscraper" projects, like Mjøstårnet or HoHo, provide important insights into the potential of timber construction in the context of extreme density - even if Brumunddal is not considered an urban environment. When combined with sustainable forestry, such timber construction could be an important contribution to sustainable, climate-neutral urbanization. The limits of high-rise timber construction are far from being reached. A series of designs for much more ambitious projects such as the Oakwood Timber Tower, the "Baobab" or the W350 have been around for quite a while. The title of "tallest timber house" - no matter who it clinches it - will only be owned by one and the same building temporarily. Next post: Industrial buildings: The ugly ducklings of architecture?